Well in the Desert has announced that 19 of the Coachella Valley’s top entertainers and musicians will perform at this year’s Desert Jam Session, the non-profit’s popular annual fundraising event. 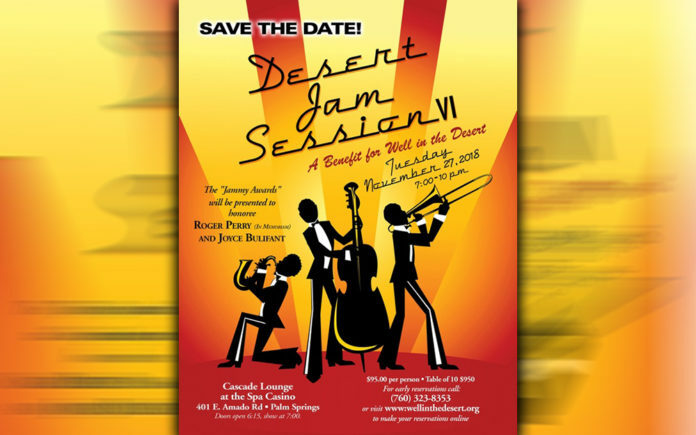 Desert Jam Session VI takes place on Tuesday, November 27 in the Cascade Lounge of the Spa Resort Casino, and is expected to draw more than 200 enthusiastic music lovers and supporters of Well in the Desert’s food programs, according to Arlene Rosenthal, the organization’s President, and Event Producers Darci Daniels Murphy and Nancy Rosenthal. The outstanding artists confirmed to date include: Lauri Bono, Wayne Boyer, Kal David, Michael D’Angelo, Darci Daniels, Frank DiSalvo, Will Donato, Yve Evans, Jimi “Fitz” Fitzgerald, the Gand Band, Tony Grandberry, Kevin Henry, Michael Holmes, Keisha D, John Stanley King, Barry Minniefield, Sharon Sills, Siobhan, and Reggie Vision. They’ll be backed up by the Jackson Garrett Band led by Chris Gore. The Coachella’s favorite weathermen, CBSLocal2’s Patrick Evans and KMIR’s Bryan Gallo, will emcee. The jam session starts at 7:00 p.m., but doors will open at 6:15 p.m. so guests can first enjoy a no-host bar, a delicious buffet dinner and have a chance to participate in both silent and live auctions. They can also watch live action artist Greg Kalamar as he creates a vibrant painting on the spot that then becomes one of the live auction items. The Well’s 2018 “Jammy Award” will be presented to one of the valley’s favorite celebrity couples, film and television actors Joyce Bulifant and (in memoriam) Roger Perry. Bulifant is best known for her role on The Mary Tyler Moore Show (she played Gavin McLeod’s wife) and game shows like Match Game. Among Perry’s many television credits are Harrigan and Son (he played Jim Harrigan, Jr.), and appearances on Star Trek, The Andy Griffith Show, Ironside, Barnaby Jones and The Texan. Perry, who passed away unexpectedly in July, was also a musician and composer and accompanied his wife in her one-woman shows such as “Remembering Helen Hayes, With Love.” They have shared their talents for the benefit of many local non-profits, and in 2014 were honored with a Golden Palm Star on Palm Springs’ Walk of Stars. Desert Jam Session sponsors to date include: Cardriner Bowden, Dr. Sandra Curry, Michael Holmes, the Hyman and Mintz Foundation Family Foundation, Dr. Timothy Jochen, Dennis Jory, MJH Productions LLC, Matt Naylor, Charles Paglia and Joe Giarruso, Palm Springs Waste Disposal, Nancy Rosenthal, and Winds West. Well in the Desert serves the working poor, seniors, veterans, children, handicapped, and those homeless in the west end of the Coachella Valley. Proceeds from Desert Jam Session will support the Well’s food programs that provide daily hot meals to the hungry, supplemental food distribution, emergency food boxes and in-home delivery to those in need. Tickets for Desert Jam Session are $95 per person. Reservations can be made by calling (760) 323-8353. More information about Well in the Desert is available at www.wellinthedesert.org. Next articleIs the “Housing Bubble II” Getting Ready to Burst?